Humboldt's hog-nosed skunk, also known as the Patagonian hog-nosed skunk (Conepatus humboldtii) is a type of hog-nosed skunk indigenous to the open grassy areas in the Patagonian regions of Argentina and Chile. It belongs to the order Carnivora and the family Mephitidae. This skunk is small and stocky, with a bare nose elongated for the purpose of finding ground beetles, grasshoppers and crickets . Its fur is brownish-red with two symmetrical stripes on either side, extending to the tail. It ranges from 30–34 cm in body length, with a 17- to 21-cm tail. They usually weigh 1.5 to 3.0 kg. The skunk has long claws and well developed forelimbs in order to dig to locate prey . Its teeth are specialized for the consumption of invertebrates and fruit, their lower molars are adapted for crushing such resistant foods. Similar adaptation of the molars is seen in the South American gray fox . Like all South American hog-nosed skunks, it is smaller with a more primitive skull and tooth structure than North American skunks . There is high pressure from intraguild predation on Patagonian hog nosed skunks. It is often preyed upon and targeted competitively by larger carnivorans such as the culpeo, chilla fox, Geoffrey's cat, pampas cat, Andean cat, and puma. It however is unlikely to target other carnivorans . Patagonian hog-nosed skunks are omnivorous, feeding primarily on insects but also on vertebrate prey, such as rodents and carrion during winters, when insects are less abundant . Patagonian hog nosed skunks have also been known to eat fruit . Unlike other South American carnivorans it is less effected by competition from increased dietary homogenization in areas where native prey species has gone extinct due to its largely strictly insectivorous diet . Patagonian hog nosed skunks are crepuscular, active primarily at dawn and twilight. It does little in the way of active hunting, selecting prey that is easiest to capture. During the winter seasons it shifts from its open grassy habitats to shrubs, forests, and mountainous areas as insect populations decline to seek alternative food sources . C. humboldtii's and C. chinga's status as separate species is debated. There is a high degree of observed variation in coloration and pattern within the two species and observed differences are inconsistent . Much of the variation in shape and size observed can be attributed to environmental influence . Morphological comparisons show a wide overlap in skull and mandibular structure, as well . ^ Emmons, L. & Helgen, K. (2008). "Conepatus humboldtii". IUCN Red List of Threatened Species. Version 2008. International Union for Conservation of Nature. Retrieved 27 January 2009. ^ Wang, X., & Carranza-Castañeda, Ó. (2008). Earliest hog-nosed skunk,Conepatus(Mephitidae, Carnivora), from the early Pliocene of Guanajuato, Mexico and origin of South American skunks. Zoological Journal of the Linnean Society, 154(2), 386-407. ^ Oliveira, T. G., & Pereira, J. A. (2013). Intraguild Predation and Interspecific Killing as Structuring Forces of Carnivoran Communities in South America. Journal of Mammalian Evolution, 21(4), 427-436. ^ Palacios, R., Walker, R. S., & Novaro, A. J. (2012). Differences in diet and trophic interactions of Patagonian carnivores between areas with mostly native or exotic prey. Mammalian Biology - Zeitschrift für Säugetierkunde, 77(3), 183-189. ^ a b c Schiaffini, M. I., Gabrielli, M., Prevosti, F. J., Cardoso, Y. P., Castillo, D., Bo, R., . . . Lizarralde, M. (2013). 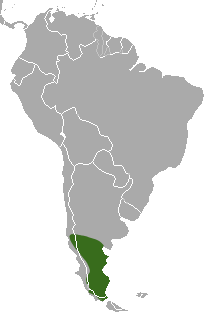 Taxonomic status of southern South AmericanConepatus(Carnivora: Mephitidae). Zoological Journal of the Linnean Society, 167(2), 327-344.